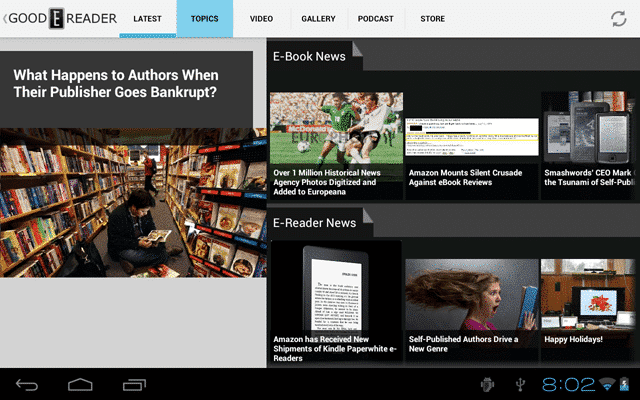 The Good e-Reader News App has finally hit Android and is available to download from Google Play or the Good e-Reader App Store! We announced this a few days ago and would like to give you a taste of what the app is all about via a standalone video! This should give you a sense on the UI and various menu options we have available! You can stay updated on the latest events in the e-reader, digital publishing, and ebook world, as well as the industry as a whole. If you love being regaled by multimedia, then you should dig our 500+ video review library of all the latest gadgets and the Good e-Reader Radio Show!